Thinking of renovating your walls? Use our wall standards to create your own wall system. Wall standards are DIY wall system and simple to setup. 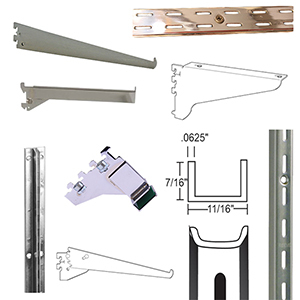 Wall Standards and Brackets with the right size shelf will add function to underutilized walls. You have control of how wide and tall you want with our wall standards. Non Heavy Duty – 1/16” Thick Steel. No matter the type of retail store, American Retail Supply believes that Wall Standards add décor to your store with minimal effort. Knife edge Brackets, Facouts, waterfalls with hooks and balls, flange brackets, and much more attached to Wall Standards.